Ever since my mum died, I've tried to avoid things relating to Mother's Day because they remind me of my loss, but something that happened earlier this week made me think that perhaps her spirit is still watching over me. 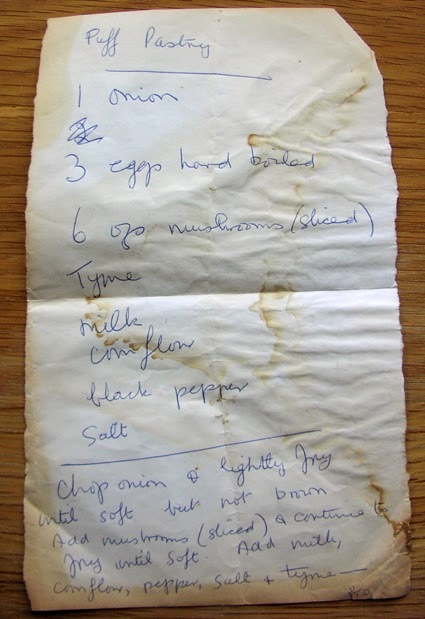 As I reached up to get a cookery book from the shelf, instead of just getting the one book I wanted a whole avalanche of recipes showered down on my head - cuttings from magazines, little cards picked up at the supermarket and many scraps of paper on which recipes had been jotted down. Chop the onion and lightly fry until soft but not brown. Add sliced mushrooms and continue to fry until soft. Add milk, cornflour, pepper, salt and thyme. Cook until right [thick] consistency (stirring all the time). Remove from stove and added chopped hard boiled eggs. Put aside until cold. There was something crossed out after "very", but I couldn't quite read it, so I guess it will be a bit of trial and error to see how long it takes to cook. I wouldn't think it would take too long. At least modern ovens have a glass front so you can peer in and see if the pastry has puffed up and turned a nice golden colour. I might try cooking this on Mother's Day in her memory, but I think it would also be a great vegetarian recipe to eat at Easter.